The first part of this post, which needs to be read first, set down goals for making your own wellness program. No one can do this but you, and at the same time, you need to be complete in your approach, which involves looking at both success and failure as the journey unfolds. No one walks a straight line on the journey to wellness. Most studies of lapses in fitness, nutrition and recovery programs show that you can get back on track more easily if you have scripted the way you will recover. It's also known that those who are successful in breaking highly addictive habits, such as chain smoking, tried and failed any number of times before finally succeeding. So persistence counts, and so does avoiding the familiar excuse of "I've tried everything." The answer is to go back and try everything again. Take charge. Accept responsibility for your own behavior. Buy time. If you're tempted to keep indulging, wait a few minutes and see if the desire passes. Try distracting yourself -- call a friend or take the dog for a walk. Be gentle with yourself. Practice self-forgiveness. Try not to think of your slip-up as a catastrophe. Ask for and accept help. Asking for help is a sign of good judgment, not weakness. Work out your guilt and frustration with exercise. Use it to elevate your mood and recommit to your goals -- never use it as punishment for a lapse. Problem-solve as you go. Identify the problem and create a list of possible solutions. If you try one that doesn't work, try the next solution. Recommit to your goals -- review your goals and make certain that they are still realistic. Reaching a wellness goal, once it has happened, is a big deal. Make sure you mark it accordingly. If you have given up smoking for a long period of time, treat yourself to new shoes or a great book. If you've lost weight, buy yourself a new outfit. You deserve to be rewarded, while making sure that you don't rationalize going on a credit card binge or eating a huge meal as some kind of false reward. Ironically, after all the effort you've put in, life will go on nearly as usual once you achieve your goals. You have reached a new plane of awareness that becomes normal, and by definition the normal feels unremarkable. Even so, cherish the fact that you could and did raise your consciousness. Also take joy in the fact that the journey continues. There are always higher plateaus of awareness ahead. And even though you realize the positive results you have gained, including improved health and greater satisfaction with your life, reaching your goal won't resolve every problem in your life. If you haven't yet reached your goal and you find that your progress is slowing down as you approach it, you may want to revisit whether your ultimate "magic number" is realistic. Goals can be measured by a quantifiable means for the sake of marking progress. But your ultimate goal is really to be healthy, feel better, and enjoy your life more. If you find yourself falling short, give this some thought: Maybe you've already arrived. The secret of long-term success is the same as for short-term success: awareness. People who regain the weight they lost are confronting certain hormonal surges, as researchers have proven, by which the body seeks to regain something it thinks it needs -- those extra pounds. But we are all more aware than our hormones, contrary to popular assumptions. The fact that a chemical tells our brain that you are hungry is normal; it's how we know to eat for sustenance. But that chemical message enters a multi-layered network of reactins going on all the time. You can be hungry and too busy to eat, or too distressed, or distracted, forgetful, sleepy, exhausted, and any number of other things. The trick is to register the hunger impulse and sitll make your own conscious choice. Therefore, my take is that regaining the weight you lost occurs not from raw calories or hormonal messages -- even though they cannot be discounted -- but from repeated lapses of attention. You can't be on autopilot to maintain your healthy lifestyle. Every day you'll be making conscious decisions to determine the staying power of those new good habits. Instead of taking on awareness as a burden, accept it as the source of your power as a conscious person. 78 percent eat breakfast every day. 75 percent weigh themselves at least once a week. 62 percent watch fewer than 10 hours of TV per week. 90 percent exercise, on average, about one hour per day. Recovery from addiction to nicotine, alcohol, or illicit drugs is notoriously tough, and backsliding is far more common than not. One study looked at recovering addicts who had been abstinent for an extended time (median 12 years). They described the most significant factors that helped them both to start and maintain their recovery. 46 percent said the escalating consequences of substance use. 30 percent mentioned support of peers/family/friends. 26 percent joined 12-step fellowships (Alcoholics Anonymous/NarcAnon). 22 percent had a substance-related accident, arrest, or other legal trouble. 22 percent said treatment or professionals. 16 percent surrendered, wanted to move forward, recover. 10 percent experienced the birth of child, wanted to be responsible parent. 10 percent cited spirituality, a higher power. Know what your current health status is. Know why you want to change your life. Give priority to the aspects of your life you want to change first. Plan for what might go wrong along the way. Make small, steady changes at first. Write things down and keep a journal of your journey. Use awareness as the best way to maintain your new lifestyle for the long haul. I don't find myself completely in accord with the common notion that the monkey never gets off your back, a truth accepted by recovering addicts -- which may be true as they experience life -- but which has also been widely adopted elsewhere. Not every bad habit is an addiction. There is a difference between a neural pathway that ingrains a bad habit and a neural pathway that ingrains a good habit. But more importantly, there is the possibility of freeing the brain, making it serve your desire for personal freedom. No one knows in the end why some habits are so destructive and imprisoning that they rise to the level of addictions. In common parlance, we ignore what we don't know and say "I'm addicted to chocolate," or "I need a fix of comic books," when in fact nothing is holding us prisoner; we could do without as easily as not. Instead of leaning on the addictions model -- with a nod to those who find it a lifesaver -- I think the model should be a state of higher awareness, free will, constant evolution, and unlimited personal growth. Those are the precious foundation of wellness, not the mere fact that we consider ourselves healthy and intend to stay that way. 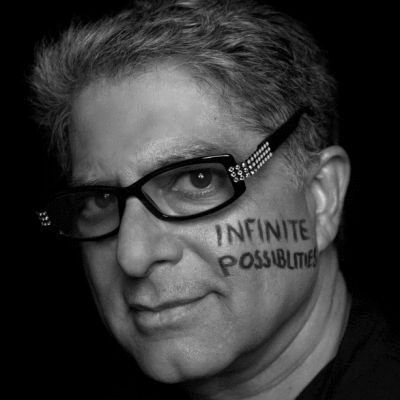 For more by Deepak Chopra, click here. For more on consciousness, click here.